Yoga For Runners is beneficial because Running is a high-impact exercise. There are ways to reduce injuries and harmful effects on the body. One practice is through yoga, and there are many poses in yoga for runners. Yoga can be a series of stretches to relax the body and mind. In addition, there are many stretches that help alleviate muscle soreness and loosen them up after a workout. Running is one such exercise where many muscle groups are active. If one happens to be an active runner, the body builds up quite a bit of wear and tear. There are many benefits to running. Some general effects include weight loss and mood improvement. Running can also help to increase joint flexibility, lower-body strength, speed, endurance, and coordination. The risk of cardiovascular disease can be greatly reduced through running. With so many benefits to running, it is easy to forget about other effects the practice can have on the body. Running too much can affect the knees and joints negatively. 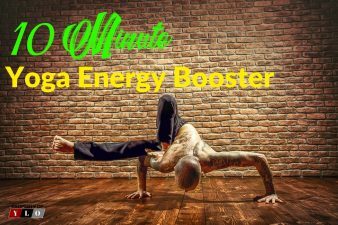 This exercise practice is predominantly a lower-body workout, and it is necessary to rest that part of the body between sessions. Running is high-impact, but there are ways to reduce injuries and harmful effects on the body. 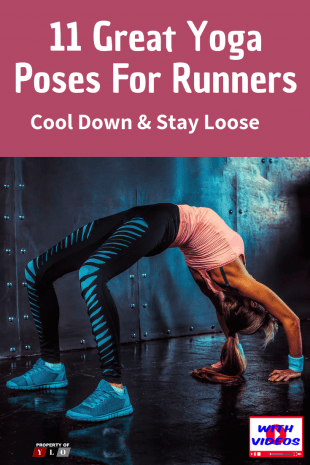 One practice is through yoga, and there are many poses in yoga for runners. How Can Yoga Be Helpful to Runners? Running is a repetitive exercise that can cause leg muscles to tighten, affecting the stability of the runner. It is necessary to stretch those muscles before and after a running session. By relying on yoga to align the bones and muscles of the body, a runner is at a lower risk of injuring oneself. Yoga can help a runner recover quicker after a session and generally makes running a safer sport. One does not have to be an expert yogi. 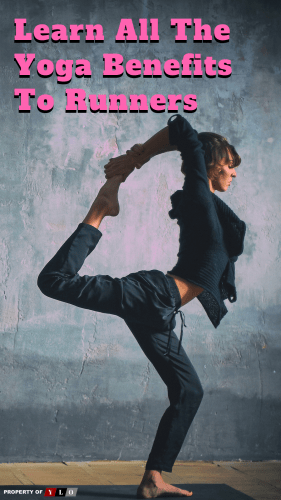 There are many beginner yoga poses that are beneficial to runners. If a pose causes pain, it can be modified to better suit the individual performing the stretch. Yoga is all about doing what is right for one’s own body. 3. Exhale as you tuck your toes and lift your knees off the floor. Reach your pelvis up toward the ceiling, then draw your sit bones toward the wall behind you. Gently begin to straighten your legs, but do not lock your knees. Bring your body into the shape of an “A.” Imagine your hips and thighs being pulled back from the top of your thighs. Do not walk your feet closer to your hands and keep the extension of your whole body. 8. Engage your quadriceps. Rotate your thighs inward as you continue to lift your sit bones high. Sink your heels toward the floor. Align your ears with your upper arms. Relax your head, but do not let it dangle. Gaze between your legs or toward your navel. Stretch your elbows and relax your upper back. 1. Begin in a plank position with hands directly below shoulders. 2. Step your right foot forward to the outer edge of your mat next to your right pinky finger. 3. Relax through your hips and back, letting them sink toward the ground. 4. Breathe and hold for 30 seconds. Switch sides. 2. Transition to ‘downward facing dog’. 1. There are many ways to come into the triangle. Entering from warrior II works well because your feet are already in the correct position. You shouldn’t need to widen or narrow your stance for this transition. So, from warrior II, straighten your front leg (the right leg in this case). 2. Engage your right thigh muscles and draw your right femur into its socket. Extend your right hand toward the front of the room, keeping your right hip tucked. 3. Lower your right hand down onto your shin or ankle. If you are more open, bring your right hand to the floor on the inside or on the right foot. Do whichever one feels most comfortable. 4. The left shoulder stacks on top of the right one as you open your chest, reaching your left fingertips towards the ceiling while keeping your left shoulder rooted in its socket. 5. Turn your head to take your gaze up toward your left fingertips. If this is uncomfortable for your neck, it’s also fine to keep the head in a more neutral position. 6. Continue to draw your right thigh muscles upwards, deepening the crease in your right hip. 7. Soften your right knee slightly (this is called a micro-bend) to prevent hyperextension. 8. Stay for at least five breaths. 9. Repeat the pose with your left leg forward. 1. Begin in a plank position. Tighten your abdominals and pull your right knee toward your right hand placing your right foot as close to your left hand as you can. 2. Keep your back leg long and keep your hips even as you relax your weight through the middle of your hips. 3. Slowly begin to lower your chest over your front shin relaxing forehead on the mat and arms stretched overhead. 4. Breathe and hold for 30 seconds. Slowly lift chest up, step back into plank and switch sides. 1. From Tadasana, bring your left knee toward your belly. 2. Reach your left arm inside the thigh, cross it over the front ankle, and hold the outside of your left foot. If your hamstrings are tight, hold a strap looped around the left sole. 3. Firm the front thigh muscles of the standing leg, and press the outer thigh inward. 4. Inhale and extend the left leg forward. Straighten the knee as much as possible. If you’re steady, swing the leg out to the side. Breathe steadily; breathing takes concentration, but it helps you balance. 5. Hold for 30 seconds, then swing the leg back to center with an inhale, and lower the foot to the floor with an exhale. Repeat on the other side for the same length of time. 2. Spread the fingers wide apart with the middle finger facing forward, and the palms shoulder-width apart. 1. Lying on your back, bend both knees and place the feet flat on the floor hip-width apart. Slide the arms alongside the body with the palms facing down. The fingertips should be lightly touching the heels. 2. Press the feet into the floor, inhale and lift the hips up, rolling the spine off the floor. Lightly squeeze the knees together to keep the knees hip-width apart. 3. Press down into the arms and shoulders to lift the chest up. Engage the legs, buttocks to lift the hips higher. 5. To release: exhale and slowly roll the spine back to the floor. 1. From Child or Hero pose, come up onto both knees, placing them hip-width apart. Place the palms of the hands on the sacrum with the fingers pointed down. 2. Inhale and press the knees down reaching the crown of the head up to lengthen the spine. Exhale and press the hips forward, squeezing the buttocks and thighs and supporting your weight with the arms as you bend backward. 3. Very carefully reach one hand down to the heel at a time, if you cannot reach the heels keep the hands on the sacrum. If it feels safe drop the head all the way back. 4. Holding tightly on to the heels with each hand, actively press the hips forward, lifting the chest up towards the ceiling. 6. To release: slowly bring one hand at a time back to the sacrum. With both hands on the sacrum, slowly inhale up, letting the head and neck be the last to become vertical. 1. Lay down on your back. Bend your knees and place your feet flat on the floor as wide as your yoga mat. Be mindful that your toes are pointing straight ahead. Find a neutral position with your pelvis. There should be a slight space between your lumbar spine (behind your belly button) and the floor. Take a few deep breaths into your belly. On every exhale, as the breath naturally empties out, imagine your groins and upper inner thighs softening towards the floor. There are other yoga poses for runners, specifically to help strengthen, stretch, and recover. 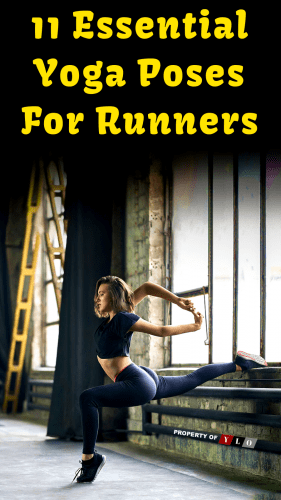 These are but a few yoga poses for runners to work into their schedule. They vary in difficulty, and it is always important to remember that one pose that might benefit one individual may not for someone else. Be sure to personalize your yoga routine and investigate poses that work for you. When you start to doubt if yoga is best for your running workout to remember that yoga is for runners.